The Warm Hearts Drive raises funds and toiletries for the Jefferson County Warming Shelter. 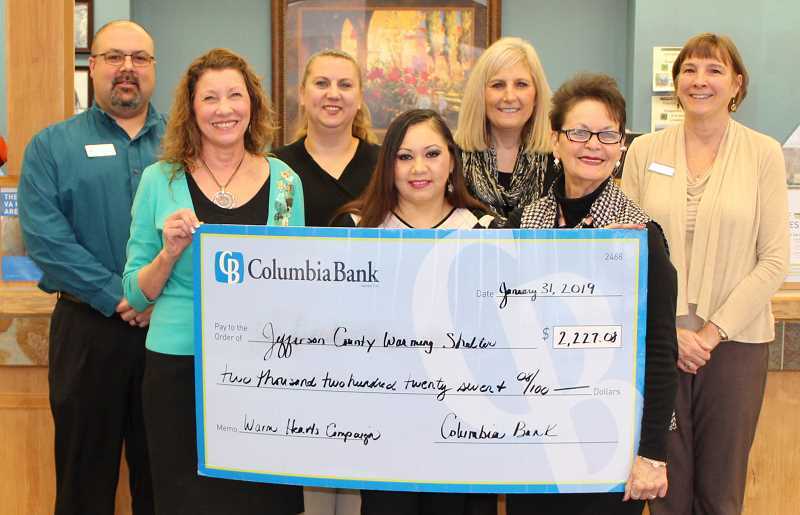 As part of its Warm Hearts Drive, Columbia Bank, in Madras, raised $2,227.08, from staff and customers, to assist the Jefferson County Warming Shelter. The bank, which has more than 150 locations and ATMs in Oregon, Washington and Idaho, raised $257,033 during its fourth annual Warm Hearts Winter Drive. The entire bank system also collected 6,542 warm winter items for 50 local homeless shelters. The Madras branch presented the check for the Jefferson County Warming Shelter to Pat Abernathy, who runs the local shelter, which was opened by local churches to serve the homeless when temperatures dip below freezing. Since the first of November, she said, the shelter has been open an average of about 20 days per month. "It was the most amazing gift," said Abernathy, noting that the bank has also provided hats, coats and gloves since the shelter opened at the beginning of November. "They have provided almost 100 toiletry bags; they have been incredibly supportive from the day we opened." The bank continues to accept donations for the toiletry bags, such as toothbrush and toothpaste, adhesive bandages, lotion, feminine products, handwarmers, socks, gloves, hats and granola bars. Items can be dropped off at the Madras bank at 624 SW Fourth St.